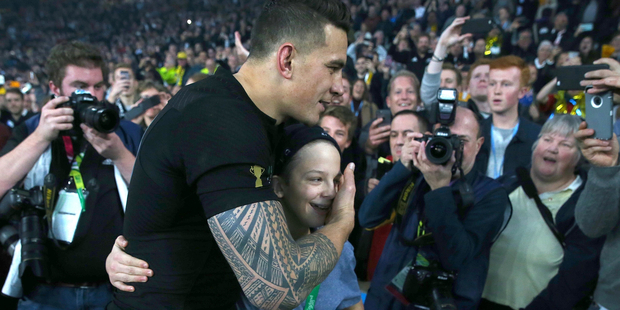 All Black Sonny Bill Williams has been presented with a winners medal at the World Rugby awards today after giving his original medal to a fan following yesterday's final win over Australia. Williams gave his medal to a young boy who was "smoked" in a tackle from a security guard after running on the field. Williams said he felt sorry for the boy, Charlie Lines. "Just before he came to give me a hug he got smoked by one of the security guards and I felt pretty sorry for him you know,"
"If that was a younger brother or cousin I would have given the security guard a hiding you know. But I just picked the kid up and took him back to his old lady and tried to make the night more memorable for him. Better (for the medal) to be hanging around his neck than mine." Williams, who next year will concentrate on Sevens and the Rio Olympic Games, had earlier thanked the nation for their support and also passed on his love to family. Williams already has plenty of silverware. In the last four years he has won the World Cup twice, an NRL title with the Roosters and three heavyweight boxing fights. The All Blacks are up for team of the year at the World Rugby awards, while Dan Carter is a nominee for player of the year and Steve Hansen coach of the year.